The first stars and tiny galaxies formed about 150-300 million years after the Big Bang, 13.7 billion years ago. They were the seeds that led to today’s myriad galaxies, including our own Milky Way. But the details of when and how they developed are still unclear. For decades, astronomers have been studying galaxies, nearby and distant, using evermore powerful telescopes. The Keck telescope dramatically enhanced our ability to characterize galaxies when it came on-line in the early 1990s, doing extensive studies of galaxies more than 12 billion light-years away. In addition, another telescope that has truly revolutionized our knowledge of the earliest galaxies is the Hubble Space Telescope. It has pushed back the frontier into the first billion years after the Big Bang. This is a key period in the evolution of the universe. It is when the cosmos was transformed from the dark ages to one filled with (initially tiny) galaxies, and when the pervasive neutral hydrogen gas became ionized. This “reionization” was likely linked to the dramatic increases in the starbirth that occurred in the newly forming galaxies. Galaxies are suspected of causing the reionization through the ultraviolet light from their young blue stars. However, the role of galaxies remains enigmatic. Our current measurements show that galaxies played a role but just don’t seem to have the “oomph” (didn’t emit enough ultraviolet light) to carry out all the reionization. During the last decade we discovered more and more galaxies at this very early epoch. Only a few were known in 2002 when the Advanced Camera was installed in Hubble. Within four years of this new camera being installed on Hubble we found more than 500 such galaxies at 950 million years after the Big Bang, but only a few were known earlier than this time. Then a new infrared camera was placed on Hubble by the astronauts in 2009. Within months, this camera was able to discover more than 100 new galaxies as they were seen 600-800 million years after the Big Bang. But we have been trying to go to even earlier times, closer to the first stars and galaxies and into a period when reionization was peaking. Just recently we reported in Nature on the discovery of a galaxy that is most likely to be forming and growing around 500 million years after the Big Bang. This is plausibly the most distant object ever seen. It was found in a Hubble image that is deepest ever taken of the universe in the infrared. The light from this young galaxy has taken 13.2 billion years to reach us. That is, we are seeing this galaxy as it was 13.2 billion years ago, when the universe was just four percent of its current age. This galaxy is tiny, about one-twentieth the size and just one percent of the mass of our Milky Way galaxy. But it is important for setting the stage for what the universe was like at such an early time. It is tough to study galaxies when the universe was young. 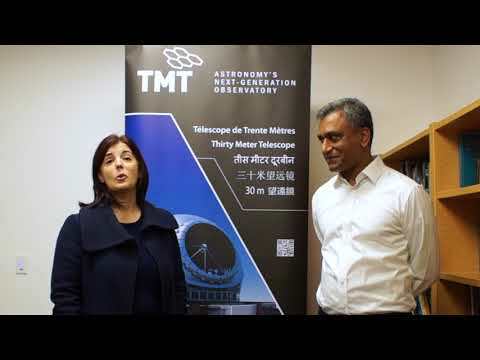 While we have made great progress with our current telescopes, and will make more over the next few years, new far more powerful telescopes are needed. Two new telescopes will make a huge impact. The 6.5 meter James Webb Space Telescope is the successor to Hubble and it will explore the epoch of the first stars and galaxies in the few hundred million years after they began to form. The tiny size of these young galaxies tells us that the Thirty Meter Telescope (TMT) with its powerful adaptive optics will also play a decisive role in helping us understand much more about how these young galaxies are forming stars and influencing the universe around them.